Four bedroom luxury town home on Whistler Mountain perched high above Whistler Creekside village, the home of the 2010 Olympic downhill races. 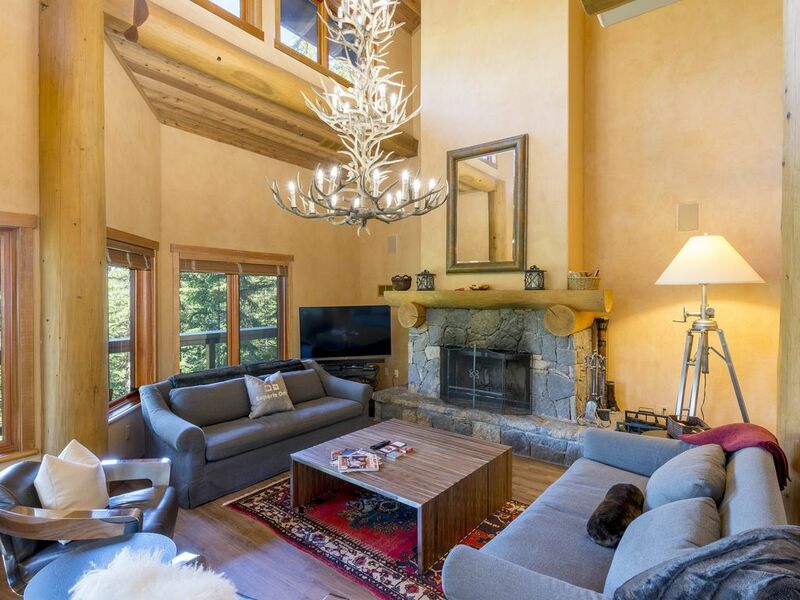 Vaulted ceilings framed by double story cedar logs and large windows let you enjoy the incredible mountain and lake views; a true mountainside retreat. Have dinner in the separate dining room and then relax in the living room curled up on the comfy sofas while enjoying a glass of wine next to the wood-burning fireplace. Enjoy the luxury of granite counters in the kitchen and bathrooms and the hide away private hot tub on it’s own deck. Enjoy the out door swimming pool in the summer available just for the 45 Taluswood homes. The Ski in/ Ski out access is available with a short walk and most suitable for intermediate and higher skiers. Watch our video for a guided tour of the house. Credit Cards: We offer secure online credit card bookings with immediate confirmation of your booking. Please inquire for more details. In the summer enjoy the outdoor swimming pool and in the ski season enjoy the ski in/ out access. Access to the ski out you will walk on a quiet road from the house for about 500 feet. From there you ski down to Creekside Gondola and you will ride up to the top of Whistler mountain (the skiers mountain). Creekside gondola is the quietest of all the lifts going up the mountain and from the top you can access the Peak 2 Peak to go over to Blackcomb mountain. Skiing back you will be on a trail going directly into the complex just a few homes away. Creekside village (with free parking) is about a 2 minute drive away and has a very good grocery store as well as the other great stores such as Starbucks coffee; the main village is a 5 minutes drive away. Luxury bathrooms with granite counter tops. Views of Alta lake from the living room and wrap around deck. Skiing back to the home you will be on a trail going directly into the complex just a few homes away. To gain access to the ski out you will walk on a quiet road from the house for about 500 feet. From there you ski down to Creekside Gondola and you will ride up to the top of Whistler mountain. Everything was as promised. Plenty of space with a nice deck to enjoy the early evening after a day of spring skiing. The "ski in ski out" requires a little bit of walking but wasn't bad. Most days we simply drove down to the Creekside area and used the free parking. The owner was very responsive and good to work with. Just as we expected...a little pricey but overall pleased. Ski in/ out as advertised..comfortable beds..garage ok for small cars..ng for SUV..close to village..hot tub needs upgrade..great water pressure and hot water in all showers..
You paid for two nights, on the first night you partied throughout the night causing the neighbours to call security twice and the police. You continued to party very loudly after all three visits. You had 50% more people in the house and a dog without permission. The next morning you were asked to leave for the blatant disregard of our policies and you agreed and left knowing the trouble you had caused. Our policy very clearly advised you that quiet time was from 10pm. You were charged for a fine from the Strata for the noise complaint and the security guard call outs all which were outlined in our sign in agreement which you agreed to and with no added cost from us even though we spent numerous hours dealing with the situation. You are the first guest we have ever asked to leave early and are very unhappy that we were put in the situation that we had to request this. I had a great time. Property was beautiful. You have to go to hotel to check in. They don’t just give you the code. Property is very nice. A short walk to ski in and out. Small plumbing issue resolved immediately by maintenance personnel. Whistler and Blackcomb mountains voted No1 ski hills in North America over the years. Skiing at it’s best or some fun hiking or mountain biking in the summer months. Discounts are available for certain extra days.